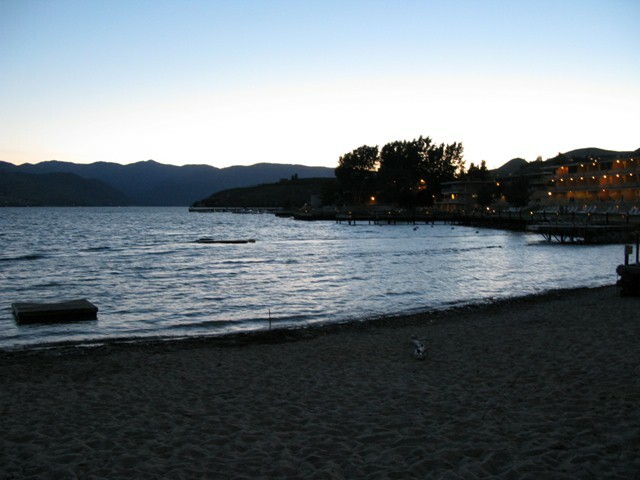 We're back in beautiful Lake Chelan, where my wife attends a conference every year. It's also become a tradition for the kids and me to come with her. I still remember the first time I came along with Cameron, who was only a few months old. It's certainly a lot easier now, even though I have to watch after two kids now. Before we left Seattle, I decided to sleep in -- and then sleep some more. Brenda had told me the day before that we were leaving early, and I'd agreed. But then I went downstairs with the boys and enjoyed a nice mid-morning nap to the soothing sounds of The Lion King. When I got back upstairs, Brenda was pulling all her bags out of our Outback and throwing them in the Jetta. I asked what she was doing, and she said, "I need to go. I'll meet you there." Ooops. Shouldn't have taken that mid-morning nap. After several minutes of negotiating -- I was standing in the entryway, and she was standing near her car -- she agreed to give me 30 minutes. "I'm in the doghouse/ And the whole neighborhood knows it..."
Sidenote: I live in a neighborhood where a public argument will become fodder for many gossip sessions. I've learned not to care about this stuff -- unless I'm truly out of line (that is, yelling). I made it out of the house in about 45 minutes, although by the time we gassed up the car and returned to the house for some stuff I'd forgotten, it was well over an hour. 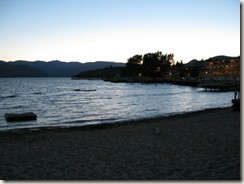 The good news was that we got to Campbell's at Lake Chelan in about 3-1/2 hours. The bad news was they didn't have our room ready. I'm not one of those people who always thinks his room should be ready -- especially when I'm getting in before check-in time -- but you think they would have given a little extra effort for the person putting on the conference (Brenda). Instead, we got the, "Check-in time is at 4:00. We'll call you if we can get your room ready earlier." Brenda had to run off to a meeting, and I decided to sit in the lobby with Drew (wearing only a diaper) and Cameron (wearing all his clothes). They raised hell, jumping on couches and having a good time. The concierge finally told them to settle down. At 4:10, I got up and waited in line to check in. When I got up to the front, around 4:25, they said they still didn't know if my room was available -- but they would check. Thankfully, it was available. But when we arrived at the room, there was a housekeeping cart sitting out front. I asked the person there if the room was ready, and they called someone on their walkie talkie. "I just told the office that that room was ready!" a man yelled on the walkie talkie. I decided at this point, they were either having a really bad day -- or they hadn't trained their staff. After we were in the room and starting to relax, I got out my new telephoto lens for my Canon G9. Fortunately, a subject appeared in the distance. 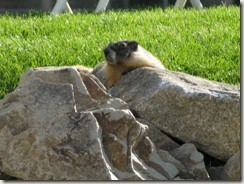 After taking a few shots, I thought maybe it was a gopher. Or a groundhog. Or a prairie dog. Later I found out it was a marmot -- probably a Yellow-bellied Marmot, which is common in the Northwest. Later I went out during twilight to take some additional pictures of Campbell's. I love this time of the day, with the mountains sharpening against the sky, the lake starting to calm.